Complex geological processes often drive biotic diversification on islands. The islands of Sumatra and Java have experienced dramatic historical changes, including isolation by marine incursions followed by periodic connectivity with the rest of Sundaland across highland connections. 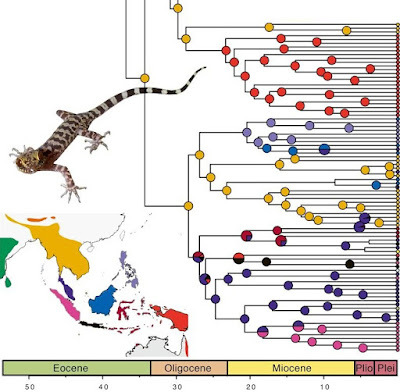 To determine how this geological history influenced island invasions, we investigated the colonization history and diversification of bent-toed geckos (genus Cyrtodactylus) on Sumatra and west Java. Leer más.